Since Elaine and I ski a bunch and also happen to work in a backcountry ski shop, with access to a fair bit of gear (don't hate, the pay ain't great! ), I figured this would be a good forum for reviewing gear. 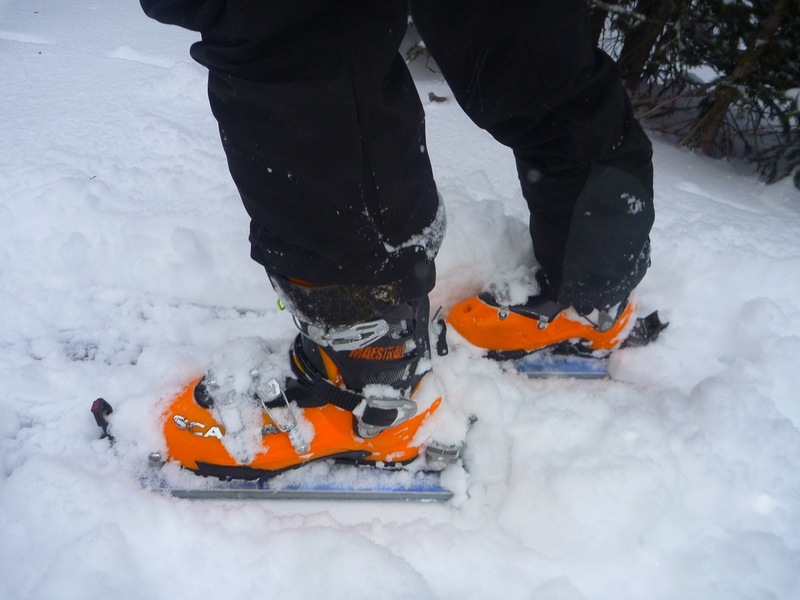 The Maestrale follows a long lineage of very orange Scarpa touring boots. In this post I'll review the Scarpa Maestrale, a four-buckle Alpine Touring boot from the Italian company Scarpa. Perhaps Elaine will add a few words about the Gea, which is the women's model of the exact same boot. The only difference between the shells on the two boots is the color (Maestrale orange, Gea green) and sizing. The Gea runs from a Mondo 22.5 to a 26.5 while Maestrale runs from a 25.5 to a 31.5. There is a subtle difference between the liners, as the Gea has a slightly lower, scooped out cuff to accomodate a woman's lower calf muscle. I've been using the Maestale for a couple of years now in conjunction with other boots – yes part of the ridiculousness of working in a gear shop is the acquisition of a boot quivver! The Maestrale is my work-horse boot, and there is a reason for that. My other boots, while better in uphill performance, are exceptionally finicky. As such, when things are off with the other boots, the Maestrale gets the call. I use the boot for resort days, demo days and backcountry days where light and fast don't matter so much. Not that the boot is heavy – my 27.5 shell and liner weigh in at 3 pounds, 8 ounces each which certainly is a very manageable range for big uphills. The Maestrale on the uphills works well. While it doesn't have the exceptional range of motion of the Dynafit TLT 5 or the Scarpa Alien, the range of motion is, for the most part, perfectly sufficient for most backcountry applications. It's really good actually. Would I recommend it for long, flat "Elk Mountain Traverse" style courses or racing? No, although in a pinch it would work. 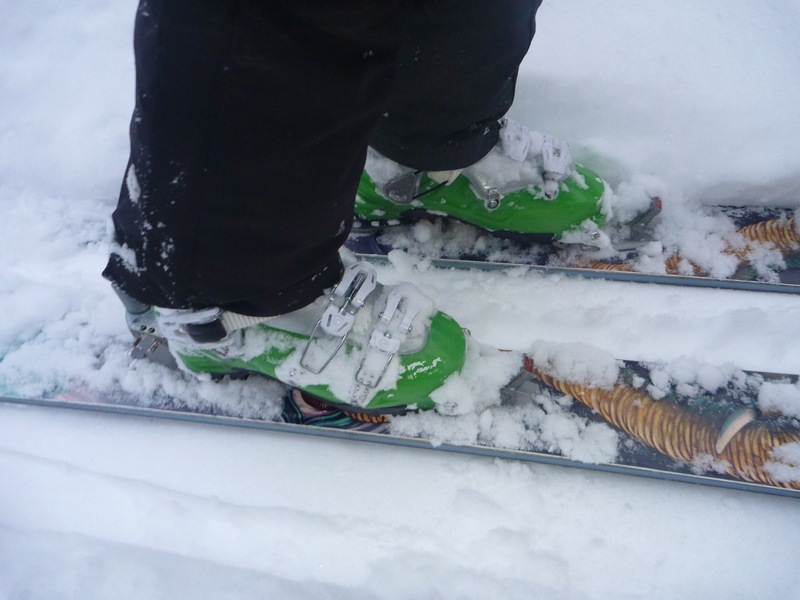 What I would recommend it for is the majority of backcountry skiing that most people do. The boot has a lever in the rear that flips up for the uphill, down for the down. When the lever is up, and the top buckle unbuckled the touring is exceptional. The flip-to-the-side tongue takes a little to get used to, but it makes it super easy to take the boot on and off. If you have haunting memories of circa-1990 Lange boots that required a hydrolic press to open up, you'll enjoy the Maestrale! How about the downhills? It goes down really well. Drop the rear lever, tighten the top buckle and let her rip! The boot isn't overly stiff, but it's not overly flexy either. Even for this ex-Vermont ski racer I find it perfectly sufficient for most situations. I have felt it "boot out" slightly when making super tight slalom turns where the skis pop a lot, but it's no big deal. I've skied the boot with skis as wide as an Icelantic Shaman, and while it might not be perfect, it works. During demo days I have skied it on super gargantuan skis – 120+ under foot massively heavy boards – and it's not made for that. There is not enough there to drive those skis. That said, this is a backcountry boot and it drives any backcountry ski just fine. Pair it up with a Volkl Nanuq or a Voile Charger and you're in heaven. Actually, pair it up with any backcountry ski, save the exceptionally light race offerings, and you'll be stoked. Note that I use this boot for the resort too. If I were looking for a B.C. only offering from Scarpa, I'd seriously consider the three-buckle Rush (or girls Blink). It's the same mold as the Maestrale, but a bit flexier and about six-ounces lighter. The last on both these boots veers towards narrow, but not ridiculously so. I've found that folks with a solid C and even low D width can fit in these things just fine. Also, I'm 150 pounds on a heavy day, so if somebody is bigger and wants a stiffer boot the new Maestale RS is a good option. It doesn't have quite the range of motion as the Maestrale and is heavier, but if you're 200 pounds and ski like Bode Miller, it's probably worth the trade-off. The biggest pro about the Maestrale is the price. No, $599 isn't cheap, but in the world of A.T. boots it is. For $599 you get a boot that tours better than anything from Black Diamond and drives a ski well. On top of that, it comes with the best liner in the business, the highly modable and warm Intuition liner. Yeah, the TLT 5 is an incredible boot, but the liners are not as moldable as the Intuitions and not as warm either. You can always replace the liner, and many do, but costs tend to add up when you're taking a $749 boot and adding on a $190-some-odd dollar liner. Don't get me wrong – I love my TLT 5's, and will give them a glowing review later on – but the cost of the Maestrale (and Rush for $40 cheaper) is very appealing, especially given the high quality of the boot and liner. The TLT 5 is like a Ferrari…the Maestrale more like a Subaru WRX. Is the boot perfect? Well, no. I wish the articulation was a bit more, but I like a ton of movement in my cuff when touring. The lever in the back of the boot sometimes fails and gets stuck in tour mode, which is less than ideal before a big, steep descent. I've never had a total failure, and notice it only happens on very cold, powdery days. The solution is simple and free – simply contact Scarpa and get a replacement lever. This was an issue with some of the earlier generation Maestrales (like the one I'm skiing) but has gotten much better over the past two years. Make sure to go to an authorized Scarpa dealer to fit and mold the boots. The proper backcountry fit is achieved when your toes are lightly brushing the front of the shell (take out the liner) and a person with normal sized fingers can fit two fingers behind your heel without too much wiggle room. If you want more downhill performance, go a bit smaller – if you are doing huge days in the backcountry or get cold feet, go a smidge bigger. Another rule of thumb is when you try the boot on unmolded it should feel generally snug, but the toes shouldn't be crunched. Who is the perfect skier for the Maestrale? Somebody who skis in the backcountry 50% of the time or more, does a bunch of hut trips, doesn't want to spend a fortune, enjoys warm feet, drives a ski up to 110 mm in the mid and isn't trying to win the World Cup rando circuit. It's a damned good boot, a blue-collar workman's boot with a big dash of Italian flash!